He achieved his third and final GM norm at the ongoing 17th Delhi International Open Chess tournament in Delhi after beating compatriot D K Sharma in the ninth round. Gukesh becomes India's 59th Grand Master. 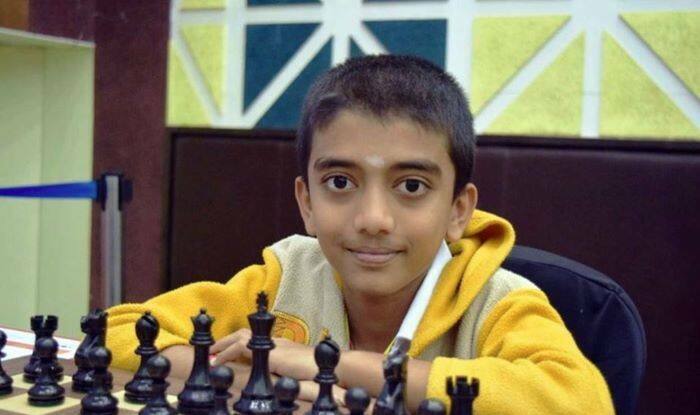 Tamil Nadu lad D Gukesh Tuesday became the second youngest Grand Master in the world and the youngest Indian to achieve the feat at 12 years, seven months and 17 days, erasing the mark set by his state-mate R Praggnanandhaa in June last year. He achieved his third and final GM norm at the ongoing 17th Delhi International Open Chess tournament in Delhi after beating compatriot D K Sharma in the ninth round. Gukesh becomes India’s 59th Grand Master. In December last, the Chennai boy had narrowly missed on the record when he lost his third round game against GM Daniele Vocaturo of Italy at the Sunway Sitges International in Barcelona. Gukesh, however, recovered and he put that setback behind him to beat and has now beaten the record held by his friend Praggnanandhaa, who was 12 years and 10 months old when he became Indias youngest GM. The youngster, who idolises the legendary Bobby Fischer and India’s own Vishy Anand, told PTI after achieving the feat that he was very happy and excited. “I am very happy and excited to have become a Grand Master. I am delighted to have won the third (GM) norm and the title. I would like to play Anand sir sometime,” he said over phone. Before the game I didnt feel any pressure, only during the game. I just forgot about the pressure and focused on my game, he added. He said he was a little disappointed to have missed out on breaking Karjakin’s record in Barcelona but felt relieved after a while and focussed on his game. The son of Rajinikanth and Padma, both doctors, the lad picked up the game playing with his parents at home and seeing his interest was enrolled in an academy in the locality. At the age of seven I joined a summer camp in my school. MS Bhaskar, was my coach there, spotted my talent and encouraged me,” Gukesh said of his early days in chess. “Now that I have become a GM I can play bigger touraments and will get invitations to challenging events. I want to improve my game and also achieve Super GM title,” he added. The Chennai lad, who trains six to seven hours a day, said he likes to watch Tamil comedy scenes to relax. Gukesh had secured his first GM norm during the Bangkok Open in 2018 when he finished 27th in a strong field. His biggest moment came when he won the U-12 World Cadets Championship with a score of 10 out of 11. He continued his great run by securing the top spot and winning the GM norm round-robin tournament in Serbia. Noted chess coach R B Ramesh, who trains Praggnanandhaa, congratulated Gukesh on his achievement. “So many norms at Delhi open! Congratulations to Gukesh for becoming second youngest GM in the world!,” he wrote on his Facebook page. Gukesh’s father said he was elated at his son’s achievement and also relieved. Rajinikanth is set to join his son Gukesh in the capital later tonight. The young chess player’s mother Padma said she was feeling great and was proud of Gukesh’s feat. “I am feeling great now and also proud of him. He was under little pressure when playing in Spain when there was a possibility of him breaking the world record in the tournament,” she added. She also wanted Gukesh to focus on improving his game and becoming a Super GM. She thanked the Tamil Nadu state chess association and the school for supporting the lad.